Parts of Houston are still flooded. Florida looks to be next. Fires burn across the west. As our lungs here in Oregon fill with smoke, I am finding myself rereading some literature on natural disasters. What follows are a few summary thoughts based on the readings, along with links for those interested in more. It should also be noted there are many more impacts beyond the pure economics and costs of rebuilding, including lost lives, health concerns and broader societal impacts. First, natural disasters can be economic disasters as well. However, natural disasters tend to impact regional economies but not so much national data. They are usually temporary in nature with the impacted region made economically whole within a year. There are Katrina-sized exceptions and the losses of course are not evenly distributed across the impacted population and business. The largest damage from natural disasters comes from the destruction of property (buildings, infrastructure, etc) which impacts the productive capacity of a regional economy. This destruction is not accounted for in GDP because GDP measures current production of goods and services. The burned houses, lost cars, and destroyed bridges were all made years ago and counted for GDP growth back then. Perversely the rebuilding phase following a natural disaster does show up in GDP data as roads and homes are rebuilt. Additionally because households, businesses and governments are rebuilding using current products and technologies the capital stock is somewhat enhanced or better off because it is replacing older equipment and buildings. Over the long-run this should support better growth moving forward. The roadmap for restarting a regional economy after a natural or man-made disaster has six stops: providing short-term income and other financial assistance to distressed households; reviving the regional economy’s disrupted export-oriented businesses; providing financial, legal and regulatory forbearance; reconstructing public infrastructure and institutions; providing tax incentives for housing and business development; and facilitating a well-functioning insurance market. Furthermore there are some very likely long-run impacts to things like tourism when scenic areas are destroyed and potential economic growth is lower given one cannot log a forest and make wood products if the forest is gone. How do you value these changes? For wood products it is more a function of lost potential activity, which can be measured in standard economic models. However for environment goods there are a number of ways, including things like existence value or contingent valuation methods. These estimate people’s willingness to pay to preserve and maintain something like a natural forest, or people’s willingness to accept its loss. While WTP and WTA are similar in concept, they differ considerably in real life due to things like loss aversion, or how humans treat gains and losses differently. Natural disasters not only scar the land but they also leave lasting impressions in our brain. I’m from the Great Plains and I remember as a kid seeing the aftermath of the Yellowstone fires of 1988 and the Great Flood of 1993 along the Mississippi River even years after the fact. The apocalyptic pictures we are seeing now of the Gorge, and outside of Los Angeles will leave a lasting psychological mark. Our hope is they do not leave a huge lasting societal and economic mark as well. OPB’s Chris Lehman reports that more than 500,000 acres have burned in Oregon this year at a cost of over $200 million. Almost all of that is on private and federal lands (the Gorge is mostly USFS land). 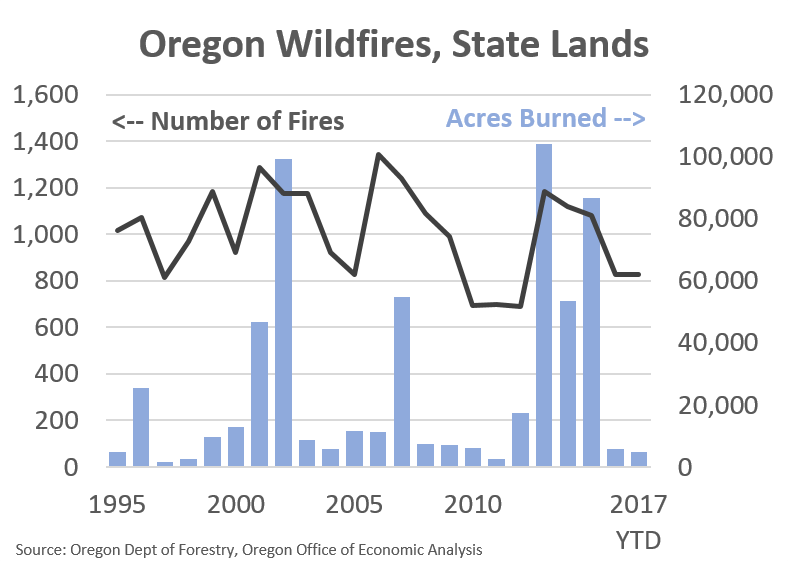 Wildfires and state lands have actually been low the past couple of years, following huge burns prior to that. From a societal and economic perspective it doesn’t matter where the fires are. However from a budget perspective it clearly does. A few years ago I know the E-Board had to authorize additional money for fighting wildfires. At extreme times the increase in seasonal fire fighters even shows up in the employment data. 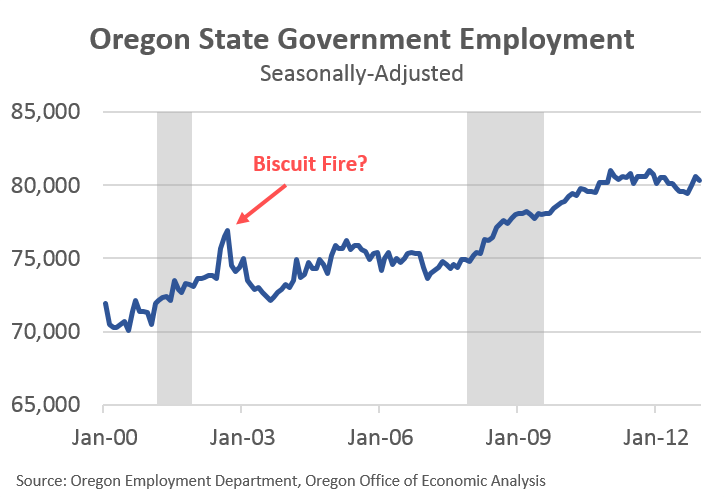 In conversation years ago with our friend at Employment, they looked into this odd spike in state employment back in 2002. It likely wasn’t regular state workers given we were in the middle of the disastrous 2001-03 biennium. They think it was likely people fighting the massive Biscuit Fire, but aren’t 100% sure of it. Headwaters Economics has lots of really good work and interactive maps on wildfires in the west, including looking at land developed in the wildland-urban interface. Headwaters also did an Oregon-specific report a few years ago as well. I found their summary slides here to be really useful. The St. Louis Fed looked at natural disasters back in the mid-1990s following the Great Flood of 1993. The World Economic Forum also has a summary article on natural disasters and firm behavior. Finally, the following risk is included in our quarterly forecast document. In an oversight it leaves out fire, however this is something our office and our advisors have been thinking about more in recent years. Climate. Weather forecasting is even more difficult than economic forecasting a year or two into the future. While the severity, duration and timing of catastrophic events like earthquakes and droughts are difficult to predict, we do know they impact regional economies. Droughts in particular impact our agricultural sector and rural economies to a larger degree. Longer-term issues like the potential impact of climate change on domestic migration patterns are likewise hard to predict and outside our office’s forecast horizon. There is a reasonable expectation that migration flows will continue to be strong as the rest of the country becomes less habitable over time.